The Rev. Martha Sterne is an Episcopal priest and author. She lives in Atlanta, GA. Since we live on Peachtree Road, we watched Atlanta run by our front door this glorious morning. First are the fleetest in their racing bikes and by the grace of God and sheer guts those who will never walk are made perfectly swift not in spite of but because of their weakness. Then come the next fleetest who run more like racehorses than humans, from leap to leap to leap to leap - spectacular and timeless as if we are looking at not the runners of 2011 but we are seeing every runner of every age. How beautiful are the feet of those who bring the good news of being human at full stretch to the glory of God. 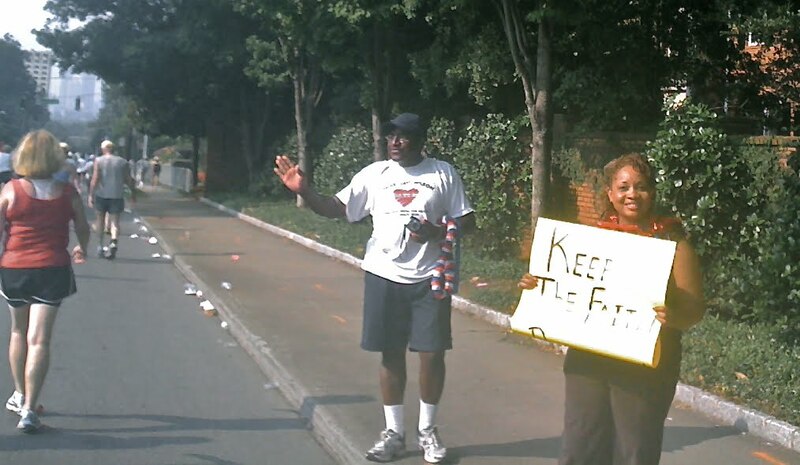 Then the very good runners who will never win the Peachtree but who run for the love of it, and clearly train and care for their bodies like God asks us to do. And then there are the rest - jogging, walking, laughing, talking - a sea of humanity in which are currents of the very young and the very old and families running together and old friends and one man who had a note on the back of his t-shirt that read "I'm 91 and I'm ahead of you!" The chubby mix in with the sleek; the gaily costumed mix in with the Talbot's ladies and total slobs and somewhere in that vast sea of humanity swirls every color, every creed, every shape, every sort and condition. And did you know - no matter who you are - that somewhere in that sea-crowd this morning is someone who loves you or who loves someone who loves you? This is true the scientists tell us. So connected are we - not only the 50,000 on Peachtree this morning - but all over God's round earth which is after all a very middling and fragile planet. How can we forget this? Alexis de Toqueville visited America in the 1830's, and he saw us, really saw us. He noticed the strong individualism which gave our ancestors the power to come to this new world and move out into wilderness and make a life. But the shadow side of the power of individualism is that, as Toqueville says, "it disposes each citizen to isolate himself from the mass of his fellows and withdraw into the circle of family and friends. And with this little society formed to his taste, he gladly leaves the greater society to look after itself." And the danger Toqueville writes is that "each one is forever thrown back on himself alone, and there is danger that he may be shut up in the solitude of his own heart." This morning there was a couple near us - not running - standing. The woman had a sign that said KEEP THE FAITH! And the man chanted - strong and deep and rhythmic chant - KEEP THE FAITH!!! YOU CAN DO IT!! STAY STRONG!! KEEP THE FAITH!! YOU CAN DO IT!! STAY STRONG!! For an hour and a half. Never faltering always blessing, blessing everyone as they ran their race towards the prize. That couple won the race for me this morning. And now I share their gospel with you. Keep the faith. You can do it. Stay strong. Keep the faith. The sermon content on this website is copyright © by the respective authors. For information on reprinting or excerpting sermon materials from this site, please contact us.